Michalss released version 2.0 of his QuickBMS GUI ! 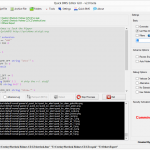 With this excellent tool you can now do some heavy scripting for QuickBMS by Luigi Auriemma in a comfortable IDE. What more can you wish ? Check the forum entry, or get it from the Tools Blog. Here’s the info on the version changes. Cities XL *.PAK file format unravelled! No task is too difficult at our fabulous Game Research Forum. Thanks to combined efforts, and a great find by bugtest the *.PAK file format of the Cities XL game is now known, and using QuickBMS you can already start extract the resources from these files. Read all about it here: http://forum.xentax.com/viewtopic.php?f=10&t=3544 Also, find many more answers to difficult formats there! You are currently browsing the archives for the QuickBMS category.